LAMI find notes app is an educational app to help children to train their ears to find the perfect musical pitch and enjoy the musical world. 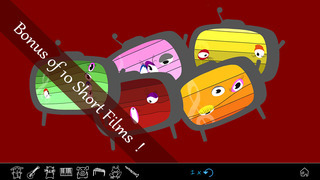 This apps uses the characters of the multi-award-winning animated series LAMI. Including Best film for children, LAMI was selected for more than 100 international film festivals. The educational game based app introduces children to a variety of musical instruments and sounds. The app allows children to become familiar with the pitch of the sounds and their representation in a musical score using instruments, animal sounds and chords. Each musical note is a character with a different personality, colour and shape. This enables the children get used to identifying pitch in a fun and stimulating way. The games featured cater for a range of differentiation and ages with multiple levels. There is also a Play Music mode where students can create and experiment with their own musical compositions. LAMI find notes app is an educational app to help children to train their ears to find the perfect musical pitch and enjoy the musical world. Upon opening the app the user is greeted by some wonderful, bright and fun graphics based on the animated series LAMI developed in the Far East. 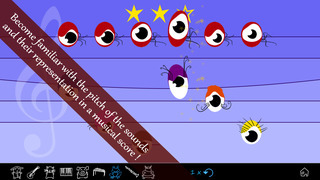 The app plays a host of musical introductions using the LAMI characters and music on the home screen. Younger students will find this enchanting. 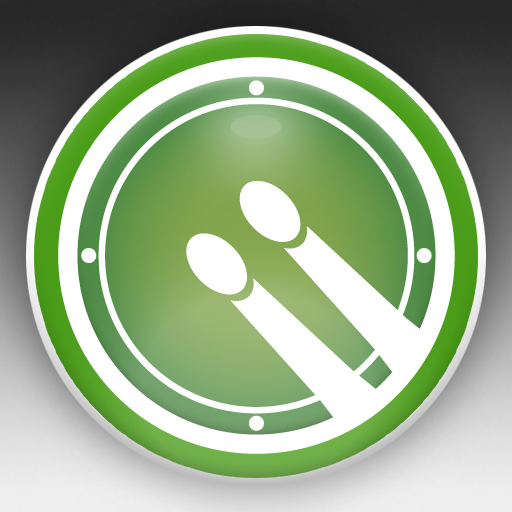 The app has three main play modes: Find Notes, Play Music and the Scoring game. Please note that the scoring game is linked to the iOS game centre where scores can be marked against other players. This function can of course be disabled for schools. The bottom left icon, when pressed, will introduce students to the LAMI characters, their sounds and personalities. This is a great starting place for student’s especially younger users. 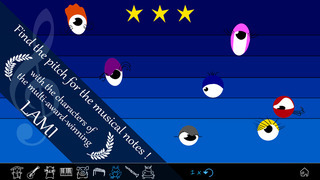 The “Find Notes” mode asks the user to work their way through a series of 7 stages each with different musical sounds or instruments. 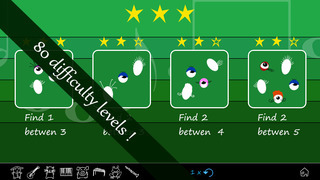 Each stage has 9 levels that need to be cleared using a star scoring system. 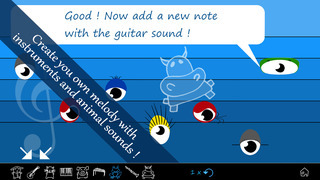 Each level plays either a note or series of notes which the user must listen to very carefully before being asked to identify the correct LAMI note or notes. The user can listen up to three times using the looped arrow icon at the bottom, the more times you listen the less stars you may score. Once the early level are cleared by identifying 1 note out of 2 the levels increase to identifying 1 from 3, 1 from 4, 1 from 5, 1 from6, 1 from 7, 2 from 3, 2 from 4, 2 from 5, 2 from 6 and 2 from 7. Some stages also ask you to identify two notes or chords together, this is certainly easier than single notes. For the most part these levels and stages are highly engaging if not somewhat repetitive. We found this play mode great fun and musically inspiring. You really get to know and love the character notes and their pitch and tones. However we would have like to see more opportunities for playback rather than just 3. Our younger users became increasingly frustrated by not being able to progress on certain levels. The recommended app age is for 5+, we believe that some of the levels are very difficult and younger uses may find this hard to complete without wanting to hear it again and again to progress. We would also like to see the actual notes being displayed on the scale to widen the audience for those studying music at a higher level. Some of the instruments have such subtle pitch that the notes become harder to recognise. This minor adjustment would not only let the user understand the pitch but also the correct musical note. The “Play Music” mode is where this app excels. Here the user can compose an arrangement of music using the LAMI notes and cords and various instruments. Some of our younger users had trouble placing the notes directly on or between the lines. We would like to see the line or section light up to denote where the note is being placed. Creating these musical compositions is highly addictive and entertaining. The ability to playback is essential and we would have liked to have seen the feature where the composition could be saved or exported elsewhere along with the ability to speed up or slow down the piece. Once out of this mode the composition is not saved. The “Scoring Game” mode can only be unlocked if the “Find notes” mode is completed, which we found a little frustrating. Once the “Find Notes” section is complete you have unlocked a variety of further musical instruments and sounds such as the clarinet and frog. These extra features are also included in the “Play Music” mode along with some short bonus animations. The developers of this app can be congratulated on its contents and you can clearly see why the LAMI animated series has won awards. The characters and sounds are charming and will appeal to students of all ages. The ability to teach children to train their ears musically is a valuable one and this app goes a long way in improving these subtle skills. We love the fact that the app enables students to explore musical notes and chords and develop their own compositions. From this stand point the app has endless opportunities. Music for kids. Find the perfect pitch for the musical notes! Including instruments, animal sounds and chords, the app allows children to become familiar with the pitch of the sounds and their representation in a musical score. Each musical note is a character with a different personality, color and shape so that children get used to identifying pitch in a fun and stimulating way. Game 1, Find Notes: Find the right pitch from instruments or animal sounds. 80 levels. Game 2, Play Music: Create you own melody with instruments and animal sounds. Game 3, Scoring Game: Endless game. Become the best in the game center ! 40 achievements ! This apps uses the characters of the multi-award-winning animated series LAMI. Including Best film for children, LAMI was selected to more than 100 international film festivals. An International team of educators, artists and specialist IT developers shared knowledge to create a very funny educational app.